It was early evening, November 9, 1938. Later that night, he climbed up on the roof of the orphanage and saw fire lighting up the city. Frankenstein, now 94, was describing Kristallnacht — the “Night of Broken Glass” — when Nazis, among them many ordinary Germans, terrorized Jews throughout Germany and Austria. They killed at least 91 people and vandalized 7,500 Jewish businesses. They also burned more than 1,400 synagogues, according to Israel’s Yad Vashem Holocaust memorial. Up to 30,000 Jewish men were arrested, many taken to concentration camps such as Dachau or Buchenwald. Hundreds more committed suicide or died as a result of the mistreatment in the camps years before the official mass deportations began. As Germany marked the 80th anniversary of the anti-Jewish pogroms this week with a series of memorial events, Frankenstein returned to the place where he witnessed the violence as a teenager. 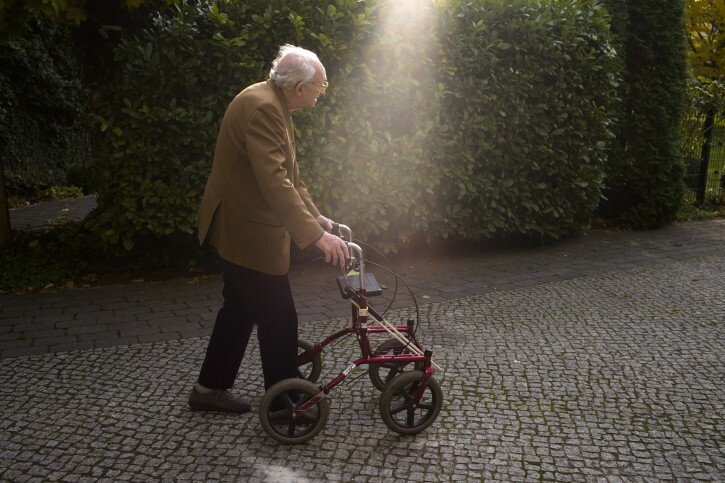 One of the dwindling number of Holocaust survivors, Frankenstein needed a walker as he slowly entered the compound where the Auerbach’sches Waisenhaus orphanage once stood. But his memory is still sharp, and he remembers exactly how the events unfolded that night. “A few hours after the plain clothes police officer had warned us, a group of men in uniforms came and told us, ‘you need to leave now, we want to set fire to the building,’” Frankenstein said during an interview with The Associated Press this week. There would have been no way to take the youngest children to a safe place that quickly, he said. Frankenstein and some of the older boys at the home managed to convince the uniformed men, who belonged to the paramilitary SA, that if they burned down the orphanage the fire would spread to surrounding buildings. “So instead, they went into our synagogue and turned off the sanctuary light in front of the holy ark,” Frankenstein said. “They did not turn off the gas and after they left, we suddenly could smell gas everywhere inside the building.” Frankenstein and his peers ran inside the synagogue, tore open all windows, and turned off the gas before it could lead to an explosion. “The men probably thought that if enough gas would stream out, the building would blow up,” he said. Kristallnacht is often referred to as the beginning of the Holocaust. It would still be years before the Nazis formally adopted their “Final Solution” for the Jews of Europe, when boycotts, anti-Semitism legislation and expulsions would evolve into a policy of mass murder. In all, 6 million European Jews were killed in the Holocaust. 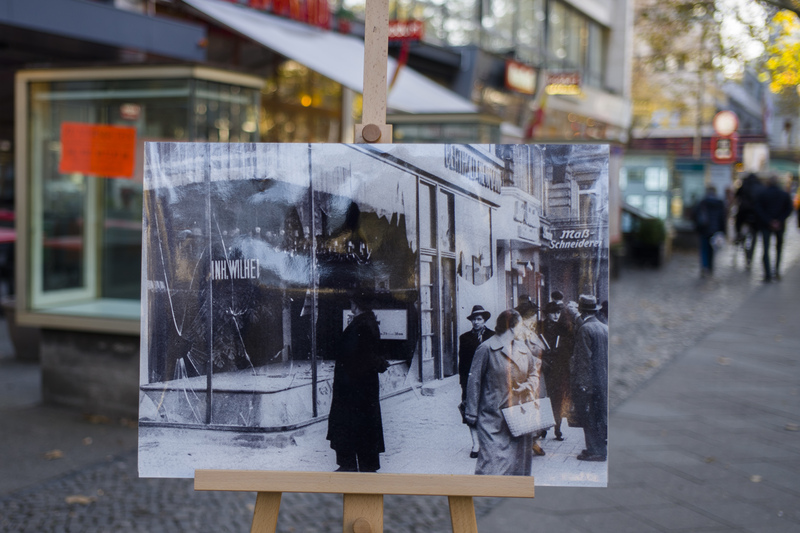 Guy Miron, who heads Israel’s Yad Vashem’s Center for Research on the Holocaust in Germany, said Kristallnacht represented an end to Jewish life in Germany, a point of no return. Standing under an old poplar tree shedding its bright yellow leaves, Frankenstein gazed at a red brick wall — the only remainder of the orphanage in the city’s Prenzlauer Berg neighborhood. The building was badly destroyed during a World War II air raid in 1943, and the ruins were torn down in the 1950s. The wall was turned into a memorial for those Jewish orphans who did not survive the Holocaust, with the names and ages of 140 children inscribed on the bricks. The youngest one, Cilla Fuks, was ten months old when she was murdered. Frankenstein was one of the few who survived. In 1943 he went into hiding with his wife Leonie, whom he had met at the orphanage, as the Nazis were deporting thousands of Jews from Berlin to Auschwitz. Together with their newborn son Uri, the couple spent 25 months in hiding in Berlin. A second son, Michael, was born in 1944, during their time on the run. In 1945, after the collapse of the Nazis’ Third Reich, the Frankensteins immigrated to what was then still Palestine. Eleven years later, in 1956, they moved from Israel to Sweden where they settled for good. Nowadays, Walter Frankenstein returns to Germany several times a year. He often talks to schoolchildren about his life and on Friday, the anniversary of November 9, 1938, he will be honored in an award-giving ceremony by Germany’s Culture Minister Monika Gruetters. In 2014, he received Germany’s highest civil honor, the Federal Cross of Merit. Every time Frankenstein travels to Berlin, he brings along the small blue case containing the cross. 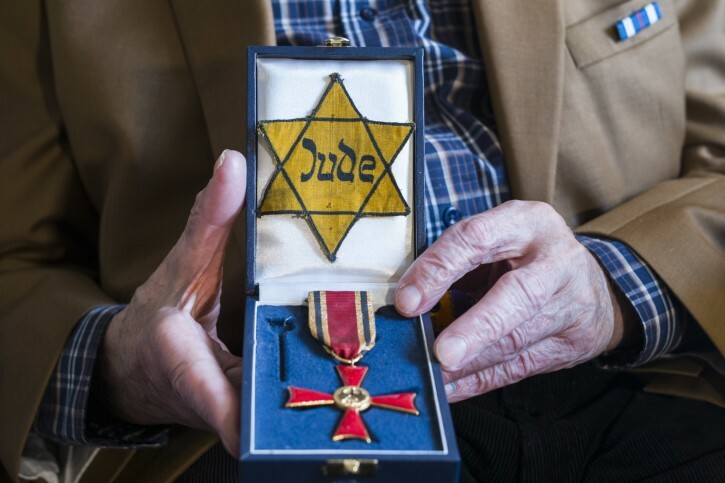 Inside the case’s lid, he has attached the first “mark” he got from the Germans: The Yellow Badge, or Jewish Star, that he had to wear during the Nazi reign to identify him as a Jew. “The first one marked me, the second one honored me,” he said as he slowly closed the lid. So my take-away from this article is that the Germans marked him for death with a Jewish symbol and honored his brave and heroic survival with a Christian symbol.